← Nice to know …. Low incomes, unemployment and benefit delays have combined to trigger increased demand for food banks among the UK’s poorest families, according to a report commissioned by the government (pdf). The report directly contradicts the claim from a government minister that the rise in the use of food banks is linked to the fact that there are now more of them. It says people turn to charity food as a last resort following a crisis such as the loss of a job, or problems accessing social security benefits. The report concludes that, while there is some evidence that welfarechanges have contributed to increased demand, it is difficult to make a clear and robust link. The review emerges as the government comes under pressure from church leaders and charities to address increasing prevalence of foodpoverty caused by welfare cuts. The End Hunger Fast campaign has called for a national day of fasting on 4 April to highlight the issue. The review, written by a team of food policy experts from the University of Warwick, was passed to ministers in June but has remained under wraps until now, creating speculation that the government “suppressed” its findings. Examining the effect of welfare changes on food bank use was not a specific part of its remit, says the report, which is understood to have undergone a number of revisions since early summer at the behest of the Department for Food and Agriculture and the Department for Work and Pensions. The researchers found that a combination of rising food prices, shrinking incomes, low pay and increasing personal debt meant an increasing number of families could not afford to buy sufficient food. Benefits payment problems – either administrative errors that can leave claimants without cash for weeks, or the temporary withdrawal of benefits as a result of sanctions –are a factor in the increase in demand for food aid, the report says. Ministers have repeatedly said there is no robust link between welfare changes and food bank use, while the welfare minister Lord Freud claimed the rise in food bank use was because there were more food banks and because the food was free. The report says that, while food banks such as the Trussell Trust collect data on the numbers of people using its services, it is impossible give an accurate estimate of the numbers of people fed by food aid providers in the UK. 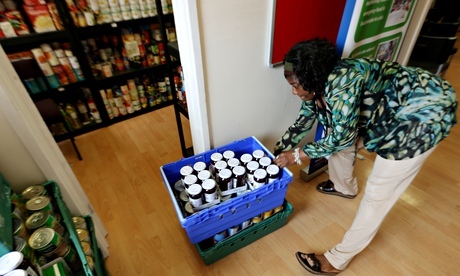 The review warns ministers that, while food banks and thousands of other voluntary food aid providers do an important job of coping with short-term hunger problems, government cannot rely on charity to tackle rising food insecurity. “Increasing numbers of households are having to deal with changes in circumstances which are potentially having negative impact on their food security in the immediate – and possibly longer – term,” says the report. It adds: “Some see it as appropriate for local groups to meet short-term food needs through temporary, non-governmental provision, but the evidence from international food security research suggests this is likely to be of limited effectiveness. “That is why this government has given Jobcentre Plus advisers the ability to say to people who need help that they can go to a food bank. Niall Cooper, of the charity Church Action on Poverty, said: “The publication of the Defra report, coinciding with the launch of the End Hunger Fast by over 40 church leaders today is a timely wake up call to government and society at large. “The report confirms the growing demand for food banks is driven by people facing crises, and directly refutes the governments claims that it is caused by the growing number of food banks. “The truth is that, since the ‘snapshot’ last March, the situation has dramatically worsened, with many food banks reporting a doubling or trembling in demand since April. The Defra review follows the publication of a Scottish government report last month which explicitly connected the rise in food bank use with the impact of welfare reforms such as the bedroom tax. The nine week Defra review, called a Rapid Research Assessment, comprised of a study of peer-assessed research in the UK and overseas, plus a series of interviews with food aid volunteers, professionals and studies of food aid projects. Separately, an all-party group of MPs launched an inquiry on Thursday into the causes of UK food poverty and food bank use. The inquiry will be headed by the Bishop of Truro, Tim Thornton, and inquiry members include Labour MP Frank Field and Tory backbencher Laura Sandys. This entry was posted in Uncategorized and tagged DEFRA, dwp, food banks, Iain Duncan Smith, Lord Freud, Trussell trust, Warwick University. Bookmark the permalink.